Many technologies claim to be holograms, but there’s really only one that truly deserves the name. If you have to wear special glasses, it’s not a real hologram. For decades, scientists have been able to use lasers to record three dimensional images on a flat surface, but these images have been very simple and were often difficult to view without more laser light. Now, a new generation of hologram companies are making 3D holograms that are photo realistic and can be viewed under simple LED and halogen bulbs. Zebra Imaging, based in Austin, Texas, is one of these new kind of hologram companies, and they’ve sold tens of thousands of custom-made digital prints, many to the US military for mission planing and bomb analysis. Watch their holographic prints on display in the videos below, along with a brief look at their new motion display technology, which is like a 3D computer screen. There’s nothing quite as cool as a real hologram. 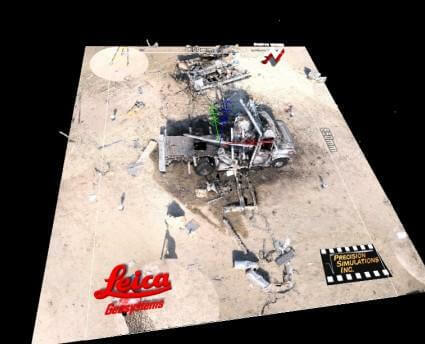 The US Army has used Zebra's prints to help reconstruct and understand bomb sites after the explosion. As you can see in the videos, the hologram print looks like a flat sheet of plastic on metal. Embedded on that sheet however, is over 300,000 3D views. By traveling around the print (or moving it) you see each of these hundreds of thousands of views and the parallax makes the image appear perfectly three dimensional. Zebra, however, can put those 300,000 views to an even more interesting use: combining multiple images into the same print. In the following video you’ll see how traveling around this print causes the 3D image you see to ‘switch’ midway. Very cool. For now, the price this holography is still a little high to be used in many possible applications. The smallest single color prints from Zebra cost $700, with full 2′ x 3′ color prints ranging up to $3500. Not bad if you have a military budget, but pretty steep for the rest of us. Considering how much progress has already been made in holography, however, I’m fairly confident we’ll see these prices come down considerably in the years ahead (if not at Zebra then through one of their competitors). Zebra's motion display setup lets you see 3D images rendered in real time. As cool as Zebra Imaging’s holography may be, the field of holography as a whole has been very slow in development. I’m sure we all saw some kind of holographic image growing up. As I said in the beginning, holograms have been here for decades (even before we had reliable lasers). The real innovation is the quality of images produced and the speed at which they can be made. A business week turn around time is fast enough for holograms to be used in a wide variety of applications. Military purposes are interesting, but they’re just the tip of the iceberg. As holography technology keeps improving we’ll be able to make these prints quicker, larger, and easier. 3D hologram prints could become a fixture for advertising, architecture, and medical displays. Imagine dozens of MRI images each showing a slice of your brain being contained in a single 3D hologram. Or walk down the street and every poster and billboard could reach out to you in 3D, or evolve as you move past. Eventually we could be using holographic displays instead of LCD TVs and monitors. The technology is still rather limited now, but it is improving. As companies like Zebra Imaging prove there is considerable financial gain to be had. I think holography will develop more and more quickly. In the meantime I really just enjoy looking at the amazing 3D images we can already produce. Everybody loves a hologram.